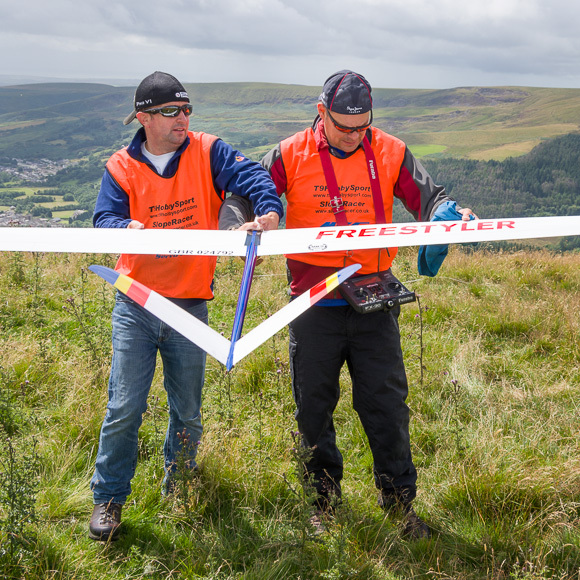 Joel West and Martin Newnham prepare Martin's Freestyler for launch. A little while ago I did a trawl of the F3F results archive and found that over 40% of the competitions had been abandoned due to poor wind/weather. So it is no great surprise that at the recent Slopeglide we only flew one of the two scheduled days. But no matter... 11 rounds were flown, a good time had by all- and a peerless Bridgend curry consumed! Mickys slope is normally accessible by car, but the gate was closed (on the orders of the Forestry Commission), so there was no option but to climb up on foot. Having reached the top, there was a short delay waiting for Martin Newnham who had the misfortune of a puncture as he was leaving home. Somehow he managed to make up for most of the lost time and the competition got underway shortly after. Conditions were quite thermic and the times were nothing spectacular, mainly mid to low 40's, with a few sub 40's. Even so, it was a thoroughly enjoyable day's competition with eleven rounds completed. The rain held off too, only soaking us during the walk back to the T junction! Sunday started off with grey skies and showers, with just the occasional puff of wind blowing into the corner of the Ice Cream slope. There was nothing to do except wait for the wind to swing round towards Mickys. But by then it had started to rain, and with the forecast saying more of the same, there was no option but to abandon. After totting up Saturday's scores, the winner was Joel West (by some margin), followed by Martin Newnham, and Stefan Bertschi in third. Most popular models were Freestylers, Needles (in various spans) and Pitbulls. A special thanks to Martin, also to Stefan for gracing us with his presence once again - and sharing the CD'ing with Martin and Joel.